DHS Cuts Water Supply to DAPL Protesters? | RANGEfire! DHS Cuts Water Supply to DAPL Protesters? 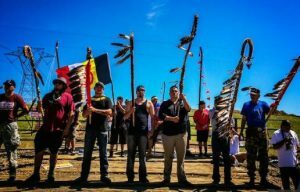 According to thefreethoughtproject.com, Cannon Ball, ND — (Common Dreams) Growing in number and spirit, the Standing Rock Sioux protest against the Dakota Access Pipeline is swiftly gaining strength ahead of a federal hearing on the controversial project. Support has spread across the country, and thousands have descended on the peaceful “prayer camps” in recent days, prompting state officials on Monday to remove the demonstrators’ drinking water supply. The supplies were provided last week by the North Dakota Department of Health at the tribe’s request to support the roughly 2,500 people now gathered along the Standing Rock reservation’s border on the Cannonball River, near where the pipeline is slated to cross. “This is nothing but repression of our growing movement to protect our water and future generations,” Houska added. Meanwhile, a U.S. District Court hearing on whether a preliminary injunction should be issued against the protesters has been rescheduled from Thursday to Sept. 8, although a restraining order against the demonstrators has also been extended until then. Filing the order on Monday, U.S. District Judge Daniel Hovland wrote that factions are ‘”strongly encouraged to meet and confer in good faith’ to try and resolve the dispute out of court,” the Tribune reported. dogs used to attack the protesters? and Amy Goodman, host and executive producer for Democracy Now, has been criminally charged for documenting attacks on indigenous protesters.??? the individuals controlling the dogs, whether they be police, military or private security, are low-life’s.